Felistas and I have now been in the USA for one week and have begun to count down towards the day of our return to Zambia. The main purpose of our visit was to attend the True Church Conference at the Grace Life Church of the Shoals, where I was preaching and also presenting a brief report on the work of missions associated with our church back home. It has been an exhilarating experience. Let me share with you some snippets from our experience of the conference. 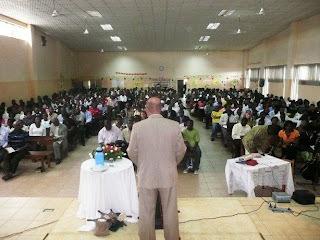 Prior to the conference, I spent my mornings on Monday 16th to Wednesday 18th teaching the few HeartCry missionaries who were able to obtain visas to come to the conference. Though few, these were truly precious moments with very precious people who are paying a dear price taking the true gospel to their own people. These men came from Eastern Europe, Asia, and the Middle East—p laces where churches are few and far between, and where a profession of Christianity is often the same as signing your own death warrant. 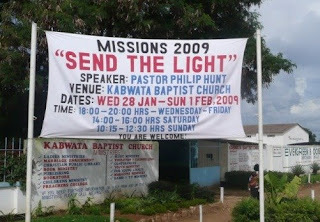 What I found most refreshing was that their concern went far beyond just wanting to multiply churches. 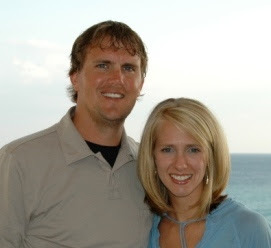 They wanted to see truly biblical churches planted wherever they were laboring. Hence, the question and answer sessions were the most heart-warming because during these times I could hear their chief concerns coming through the questions that they were asking. The True Church Conference started on Thursday 19th and ended on Sunday 22nd. It was on the general theme of “The Wonderful Grace of Repentance”. In one jump, we went from being with less than 20 men to being with over 1,500 men and women in joyful assembly—and I really mean “joyful assembly”. The worship experience alone is worth the price of the air-ticket across the Atlantic! It was largely the same old hymns containing the ancient truths of the gospel but as Thomas Clay led the great congregation in worship, you just knew that you were in the presence of the living God and worship was drawn out of your heart. Of course, the highlight of the conference was the preaching of God’s Word. 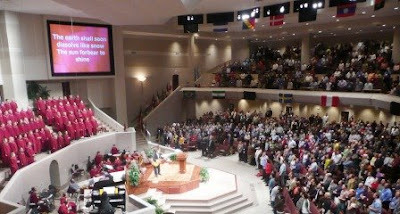 Jeff Noblit, Paul Washer and Voddie Baucham were among the preachers who graced the pulpit of the conference. 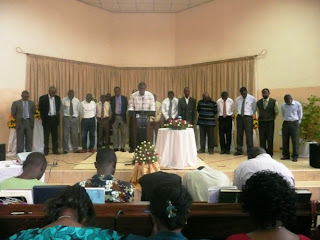 Since they have preached before in Zambia, these men need no introduction to my Zambian readers. I had the privilege of opening the conference and laid the foundation for the other preachers by dealing with “The Radical Depravity of Man”. 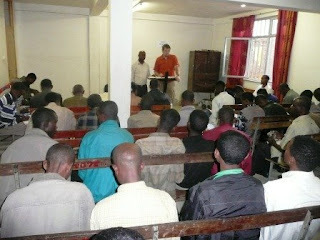 The other two preachers who are unknown to Zambian Christians were Jonathan Sims and David Miller. Jonathan is an expositor par excellence! 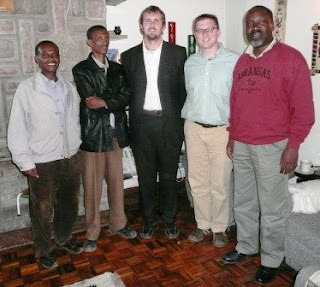 I had a chat with him afterwards about a possible visit to Zambia in August 2010. Let us pray that this works out. Well, believe me, the experience of listening to this servant of God is worth the price of two air-tickets! 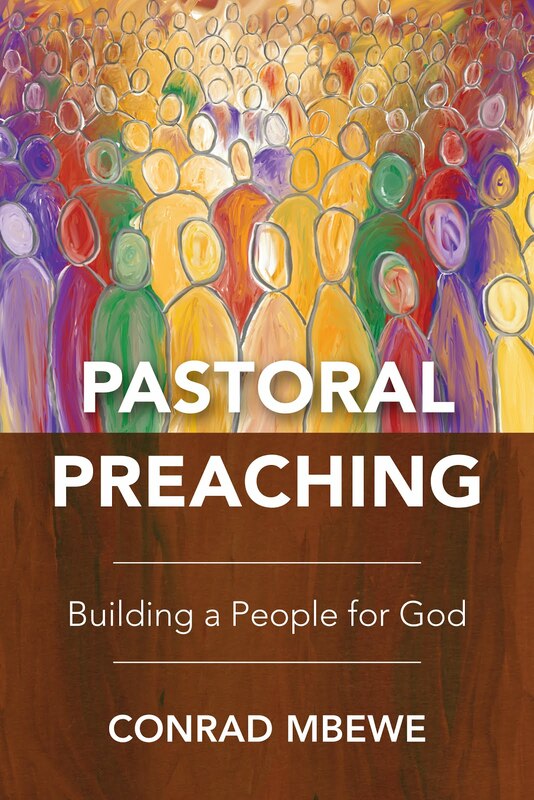 I need to say something about David Miller’s preaching. It is indescribable! I have never heard anything like it. 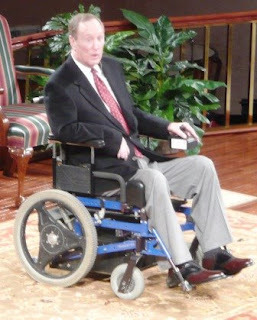 T his man suffered from a disease that left him totally incapacitated and so he preaches from a wheelchair, without a Bible and notes. And yet, he cites whole chapters of the Bible word-for-word, and expounds a section of it with very clear points and sub-points, with doctrinal accuracy, and with pungency and humour. Did I say that the worship experience at the True Church Conference was worth the price of an air-ticket across the Atlantic? Well, believe me, the experience of listening to this servant of God is worth the price of two air-tickets! As our second in-house mis sions conference drew to an end, my heart was once again filled with the vital place of missions in God’s agenda. It is so easy for this annual conference to simply become an item on the annual calendar of the church. That would be tragic! 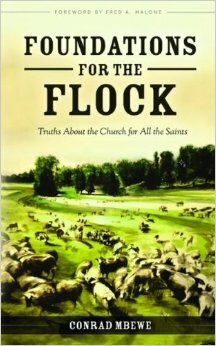 The first business of the church must be worship—an admiration of the true and living God. This must inevitably flow into the work of missions, i.e. 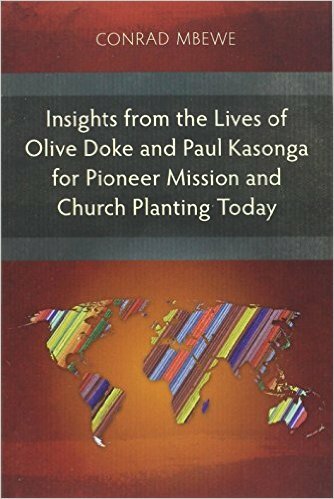 getting the gospel planted in new territories through the planting of biblical churches, so that “the earth will be filled with the knowledge of the glory of the Lord as the waters cover the sea” (Habakkuk 2:14) . That is very plain from the words of Jesus quoted above. So, our missions conference must be one of the major highlights on our annual calendar. It is a barometer of our true spiritual state as a church. It is symptomatic of how authentic our worship really is. As I looked at our missionaries during the conference I was struck once again by the fact that “God uses ordinary people”. 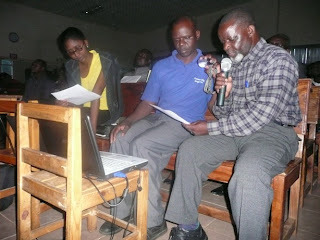 This was evident from the reports that the missionaries gave (below is Pastor Percy Chisenga, our missionary to Malawi, giving a report using a Powerpoint presentation). 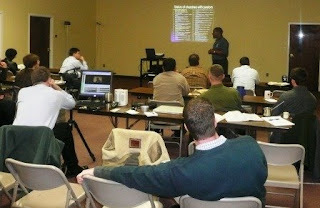 One could tell that these were men “subject to like passion as we are” (James 5:17). Some were clearly more gifted and more fruitful than others. Others evidently worked harder than others. Some fell along the way. Yet they all had one thing in common—they were ordinary people. Realising this is important if we are going to see more of our people going out to do the work of missions. Missionaries are ordinary people. They are not sup er human beings. It is a sense of call—and therefore a sense of obedience to God—that makes them go forth into the world to do or die for the sake of the gospel. This realisation is also important if we are going to take our responsibility of praying for missionaries seriously. Only God can make these ordinary men (and women) produce eternal fruit. As the apostle Paul says, “We have this treasure in jars of clay, to show that the surpassing power belongs to God and not to us” (2 Cor. 4:7). So, let us earnestly pray for them. God had touched her heart, and that is the way it must be. The greatest achievement of our missions conferences thus far has been the financial giving. The financial pledges that were made last year and this year towards the work of missions fill my heart with praise to God. 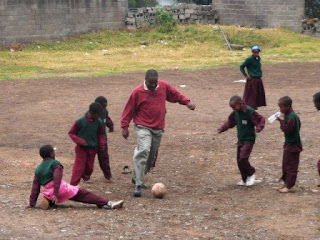 There is no doubt that we can do better, but when God’s people decide to give abundantly out of their poverty it is a powerful testimony of the grace of God at work in their hearts (2 Corinthians 8:1-5). One amusing case occurred last year and I must recount it. The deacons thought one young lady had made a mistake on her one-off pledge (she had put her name on the pledge form so that she could be reminded in case she forgot) because they thought the figure she wrote was way too high for her lowly income. Maybe she mistakenly wrote one zero too many! She assured them that it was not a mistake. God had touched her heart, and that is the way it must be. It is important for those who have gone down the mine of missions to be assured that those of us who hold the rope are equally committed to the cause of missions, especially through our financial giving. My prayer, however, remains that the missions conference will result in many among us giving our lives to take the gospel “to the regions beyond”. This is yet to hap pen. None of the twelve missionaries we presently have in the mission field have come from our own ranks (see photo of missionaries being prayed for). Be that as it may, I am optimistic that it is a matter of time. Call it faith, if you want. The growing love and zeal for the gospel in the last few years, especially among our young adults, cannot end merely with the work of neighbourhood evangelism. The dam must soon overflow its banks. 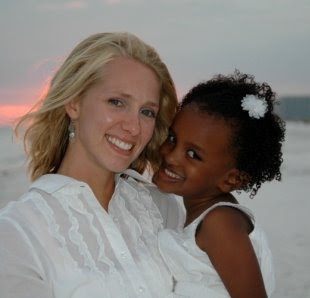 It would be wrong for us to put undue pressure on them just because we want to see home-grown missionaries. This is such a sacred work that we must simply wait upon the Lord. Yet, I have no doubt that even now he is tugging at human hearts by his Spirit. All I ask of the Lord is that I may be there when the floodgates open! For me, there was no better epilogue to the conference than what I experienced a few days later while visiting a lady in our church who had just undergone an operation. I found another lady in the church visiting her. The two of them were over-the-moon about the just-ended conference. “Pastor, we thank God that he put it in the hearts of the elders to start this missions conference. It has really enriched our lives. We can now identify with the missionaries because of the reports that we hear from them and the Powerpoint presentations that they make. It is no longer a work ‘over there’. It is our work and we really want to be a part of it. Please let the elders know how grateful we are for this initiative.” You can be sure that as I left that home, my car could feel the excitement in my heart. May this be the general feeling in the church, and may the Lord cause the seed that was sown in the hearts of ordinary people during the just-ended conference to grow and flourish. Oh, that Kabwata Baptist Church may be ablaze with a burning desire to see God worshipped in spirit and truth as his glory is made known in all the four corners of the earth through ordinary people. Amen!